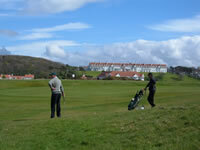 Now more than ever guests not staying at the resort will enjoy great special offers on afternoon tee times on The Ailsa. Visitors can now book Tee Times after 3pm any time in advance. What could be more perfect than a round on the legendary Ailsa in the pure, clear light of a long summer evening? Then, when the last putt has been sunk, head to the Duel in the Sun bar to reflect on the day's play. The Colin Montgomerie Links Golf Academy offers a unique teaching proposition: rather than impose a whole new way of playing on students the pros will nurture each individual's ability and concentrate on one or two critical areas. Enjoy a one hour lesson with family or friends using the state of the art teaching and practice facilities of the Academy.